This training program is built around the concept that all employees must work together as a team to deliver Exceptional Service.Go above and beyond the customer’s expectations. Offer extraordinary and superior service where you go that extra mile to excel. WOW the customer with your attention, actions, and words. First three segments: Participants learn the philosophy of exceptional service. Introduction: Concept of total customer service and the role their team plays. Customer expectation: How personnel impact the service experience. Everyone’s important: Importance of pride and professionalism of the people. Next seven segments: Participants learn specific skills and techniques to deliver quality service. Customer care: Role-playing to learn about establishing trust and empathy, and how to question, understand and provide effective solutions. Communicating quality: Learn about verbal and non-verbal communication for first impressions. Value-added service: Offering memorable service. Problem solving: Learn why customers complain and how to deal with and avoid dissatisfaction. Service recovery: Regaining customers’ goodwill after a service problem has occurred-often a result of failure to deliver acceptable service. Mistakes do happen-but switching to “service recovery” mode, taking positive steps to undo the damage, can restore the customer’s faith and loyalty. Speed: Doing it fast, doing it right and doing it now. Exceptional Service gives your employees a cultural understanding of the concept of superior service and positively changes their view of it. For customers, service begins the moment they come into contact with you – and they make a decision in a few seconds on whether you really care about them or not. Words and actions set the tone for your customer’s experience. The Exceptional Service customer service training program sharpens an employee’s customer service skills to consistently provide the ultimate customer experience. 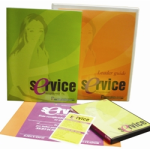 Everything you need to run the “Exceptional Service” in your own organization. Train 25 employees at once with participant guides, quality technique cards, a facilitator guide with 1 accompanying DVD, and certifications of accomplishment. Order now. Need participant packages for more than 25 employees? Add more here. Combine with participant guides to build a package for a smaller team. A user-friendly 80 page count page Leader Guide and DVDs for a leader (facilitator) to train a group of participants. Order Facilitator Package. Want us to handle the training? A Certified Trainer will present the “Exceptional Service” material to your group! Included in the seminar are Participant Packages. Minimum 20 participants required. Sign up now.